Social Business Services transform sales, marketing, customer service, and human resources aggressively and securely, using CSRA’s social business methodology. We change the rules of business operations by using digital social work processes for collaboration and business process innovation. According to McKinsey, internal collaboration and business process innovation account for most of social technologies’ economic value—far ahead of marketing and promotion—but firms need to learn how to use “social” before they can unlock the value. As explained in detail in the Social Channel, digital social networks have changed the cost of relationship and collaboration, so corporate functions that dominate organization charts need to evolve to take advantage of it. If they do not, their ability to add value to the enterprise will steadily fall, and corporate effectiveness and efficiency will drop. For example, sales and marketing are two enterprise functions that are steadily converging in many enterprises due to the pervasive adoption of digital social technologies and behaviors. Enterprises have a rare opportunity to innovate. As explained in Death of a (Traditional) Salesman, direct sales forces that don’t transform are dramatically shrinking (1 millions jobs gone by 2020) because their clients and prospects need a much different relationship with sales than before. Prospects self-educate by using digital forums and social networks, so they no longer need salespeople for education, and they postpone communication until later in the sales cycle. Conversely, salespeople that understand these changes will perform at a different level. For more on how social business is disrupting B2B sales and marketing, see The Dynamics of Change (video, podcast, or slides+transcript). 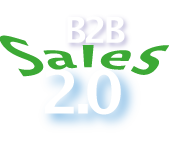 Most of B2B sales engagements focus on increasing the quality and quantity of qualified leads that are produced by the sales or busdev team (i.e. not Marketing). In phase one, the engagement team creates and validates a strategy for hyper-efficient social business interactions in which they discover and validate leads. Phase two scales the initiative. Traditional inbound and outbound B2B marketing is likewise an endangered species because prospects now have more trusted sources of information—themselves—so brands’ white papers and other content have less impact. Content marketing and marketing automation offer incremental improvements, but to remain relevant, marketing needs to get into the right room: where prospects are self-educating and collaborating. Although directly interacting with prospects requires much different skills, CSRA’s experience consistently shows that anyone can learn how. For more on how B2B marketing is using social business to change the rules, see case studies: Indium (video, podcast, or slides+transcript), Kinaxis (video, podcast, or slides+transcript). 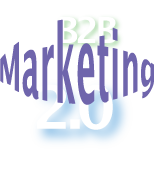 B2B marketing social business engagements focus on dramatically increasing the return on legacy marketing processes, especially event and channel marketing. In phase one, the engagement team creates and validates a strategy for hyper-efficient social business interactions involving events and channel marketing. Phase two scales the initiative. As the world accelerates its move into the service-oriented Knowledge Economy, “creative class” workers will become increasingly important to competitiveness, but the “employment” model of engaging people will continue to fall in favor of multisourcing, contracting, and consulting. These trends elevate HR’s importance while complicating its processes. Happily, HR can make most of its processes dramatically more effective by using digital social networks, once HR professionals learn how. 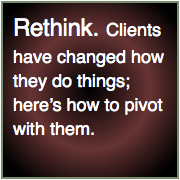 The rub is that a ground-up rethink is needed to maximize results. For more on how healthcare firms are launching products using social business, see the CerviLenz case study (video, podcast, or slides+transcript). 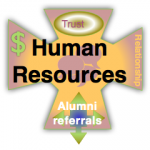 In most organizations, Human Resources is run as a cost center and is increasingly outsourced, but social business changes the game because firms can use it to transform the entire employment life cycle. In these engagements, teams often begin by addressing recruiting with social business. Phase two focuses on creating and leveraging an alumni network for recruiting, outplacement and revenue generation. What used to be called “customer service” will see the biggest change of all because it will come to eclipse marketing as the biggest source of pre-qualified prospects. This will happen because most motivated prospects are concerned that they will experience the problems that the firm’s existing customers have. Therefore, by resolving existing customers’ “problems” in public, Customer Service shows that there’s no problem with “problems,” thereby removing barriers to purchase. Tapping this gold mine requires a significant redesign of the function, but it’s necessary to compete. For more on how financial services firms are using social business to transform relationships with their channels, see case studies: Jefferson (video, podcast, or slides+transcript) or Northof41 (video, podcast, or slides+transcript). The transformation of enterprise sales, marketing, human resources and customer service is ongoing everywhere, especially when you know where to look. 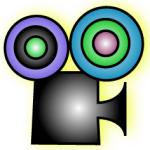 Here are our picks of CSRA posts, online discussions, and third party references. I update these lists continuously. You can also follow Social Business Services on Twitter to keep up in real time. Increasing Customer Transparency: Real Threat or a Paper Tiger for Marketers? 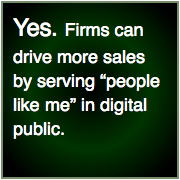 Even more posts on social business transformation of B2B sales, B2B marketing, human resources, and customer service. During client work and ongoing market analysis, I identify the most valuable thinking on social business relevant to B2B and enterprise evolution, so I present them to you here. Please note that the table is built real-time; sometimes it takes a few seconds, so thanks for your patience. Beyond the Click: What’s Truly Driving Your Conversion Rate? "If You're Not Working, We Won't Hire You!" 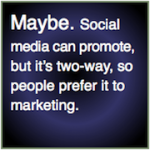 Isn’t social media about brand? Social media marketing makes brands and firms far more approachable than one-way marketing ever did, but it’s a long way away from the potential of experiential social media and social business, which focus on the meat of business: building trust, developing relationships and increasing profit. Most firms and brands have social media programs that are often popular with customers and other stakeholders, but firms rarely see a quantifiable business result. Social business leads much more quickly to money because it builds trust, and money follows trust when firms activate the Trust Business Chain Reaction. The best news is that social media and social business are very complementary when firms and brands understand their differences and design programs around each one’s strengths. Drill down into how social media and social business differ, how they’re alike, and how they work together. Why do B2B prospects lie? 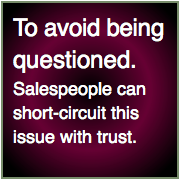 Seth Godin asserts that prospects lie to salespeople because they don’t want their decisions to be questioned when they “choose the other guy.” Although that’s an astute observation, Godin misses the gold by accepting a high level of mistrust between salespeople and their prospects, mistrust that is usually avoidable when salespeople build their interactions on trust. The first step is the salesperson truly puts the prospect’s agenda before the firm’s, and s/he uses every opportunity to show the prospect this is sincere. Being open about the firm’s offerings, discussing weaknesses and options that put the firm in a weaker position are fast routes to trust. Drill down into how salespeople can reinvent the entire selling process by aligning with prospects around trust. Better still, they can do this online, too, where a much bigger audience is watching. 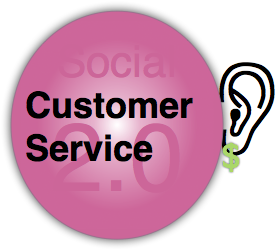 Customer service as profit center? Although few firms and brands appreciate it, prospects for their products and services fear that “the product won’t work,” so they hesitate to buy. When a customer buys a product, s/he incurs a loss in hopes that the use of the product will produce more value than its cost. Let’s focus on “the use of the product.” Even in relatively simple consumer products, “Your mileage may vary” is the mantra because the product itself produces a loss for the customer; his/her use of the product can produce “value.” This uncertainty and risk is the major barrier to sales. Customer service can address this barrier head on. Firms encourage customers to state their challenges and problems in digital public, and they solve these challenges together while being observed by a 10-100 times larger audience. How do you think prospects feel when they see “people like them” having similar fears and getting satisfaction? 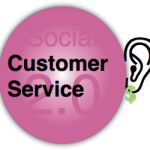 Get a detailed look at how this works in Customer Service Is the New Marketing. How do we get relevant to Generation Y/Z? Many “traditional” businesses have a growing feeling that they’re going to miss out on Gen Y’s (millennials) business because this growing demographic seems to have very different ideas about life than Gen X or Boomers. Social business can be a potent accelerator because it enables organizations to develop relationship quickly and inexpensively—when it’s focused on relating because promoting usually pushes people away. The first step is to strip away pre-conceptions and approach people by showing your curiosity about them. Develop relationship by listening and suggesting ideas relevant to your business and things they care about. 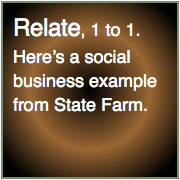 Read about how State Farm is approaching Gen Y head on. The biggest part of their business is auto insurance, and this generation isn’t thrilled about driving. Talk about disruption! Social business policy (social media policy) states “the rules” employees must follow when they interact online, but most policies are written by risk-averse human resources and/or legal departments with minimal knowledge of what the real risks are. They produce policies that communicate their fear and discomfort, so policies’ attitudes are paranoid and prevent employees from interacting effectively. Policies can add way more value than protecting firms against possible legal threats caused by employee interactions online; well researched and crafted social business policy increases trust between the employer and employees—and among employees, leading to more valuable online interactions, which improve firm reputation. Learn how smart firms use social business policy to increase trust and the quality of employees’ digital social interactions. How can banks evolve branches? Banks have stumbled badly in how they manage their branch networks, but social business can help them recover and reinvent profit at consumer and small business banking. Beginning in the 1980s, banks started encouraging customers to use technology to bank because it’s cheaper for a bank to transact (take deposit, transfer funds, dispense cash) via machine than by teller. People and buildings represent huge costs. However, adoption has exploded during the early 2010s, and banks have a two-fold problem: huge, costly branch networks that growing portions of customers don’t use, which drains profit. Secondly, the retail business model relied on upselling and cross-selling customers when they were “in the bank” for routine transactions. The branch was a way for bankers to meet with customers, who now rarely use branches. Vocal minorities (Boomers) still love branches and loudly protest when branches close. Social business can help banks increase branch profitability. Bank Branch Disruption Enables Unusual Opportunity outlines how bankers can connect with high-priority customers and prospects online to sell more services; moreover, it suggests a new 21st century way for banks to use branches to help customers with something they really care about.